Hotel Ottavia is a 2-star superior family run hotel in Rimini, located in the San Giuliano Mare area, near the dock in a quiet position. It has a mini outdoor and heated swimming pool with hydromassage (summer only), services for children, well-equipped beah affiliated with the hotel. Admits small and medium-sized pets on request. The hotel is located in San Giuliano Mare a couple of minutes walk from the beach and near the "Marina di Rimini" dock. The location is convenient to reach the Fiera di Rimini and visit the historic city center. The rooms are equipped with air conditioning and heating, telephone, WI-FI, hairdryer, combination safe, bathroom with shower. Amenities in some rooms: balcony, sea view, shower, minibar, ceiling fan. There are also studios with private entrance able to accommodate up to 3 people. Garden, open-air porch, mini heated swimming pool with hydromassage (outdoor and active in summer), bike rental, TV room, elevator, bar, coin-operated washing machine. Every Saturday organizes a Romagna evening. PARKING: uncovered and free parking spaces 70 or 120 m from the hotel. AIR CONDITIONING: available in the common areas and in the room without supplement. CONVENTIONS: beach, amusement parks, discos. SERVICES FOR DISABLED: lift for disabled people. PETS: small and medium-sized pets allowed, upon request at the time of booking. Area for animals on the beah affiliated with the hotel. BREAKFAST: sweet and savory buffet with homemade products. LUNCH AND DINNER: two-choice menu of meat and fish (only during the summer), buffet of appetizers and vegetables. Pasta and desserts are homemade. VARIATIONS: variations to the menu are possible. OTHER: typical Romagna evening every Saturday. In the hotel: outdoor playground area, strollers. At the beach: baby / mini / junior club, live entertainment. 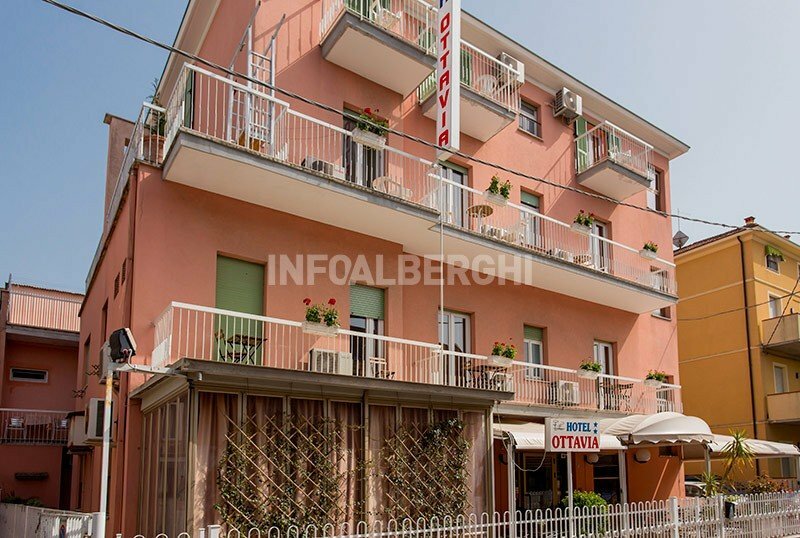 The hotel has an agreement with the Lido San Giuliano, equipped with fitness area, animal area, library, entertainment, canoes and pedal boats, children's playground area, basketball court, bowls, ping-pong table, restaurants, chiringuiti, possibility excursions, guided tours, scuba diving, boat trips, dog sitter.